Synopsis: Foreward by Gretel Ehrlich Created by award-winning illustrator and author Maryjo Koch, and with a foreword by celebrated naturalist Gretel Ehrlich, this luxurious, oversized volume is brimming with beautifully drawn four-color images of approximately 50 different species of birds--and their nests--from around the world. For the first time ever in book form, here is comprehensive range of remarkable, lifelike illustrations of bird nests, eggs, and feathers rendered in actual size. Sure to delight bird watchers as well as lovers of art and nature, The Nest not only offers a close-up look at these fascinating creatures and their intricately woven homes but is a thoughtful study of natural forms and color as well. The handwritten text, pencil-etched details, and colorful watercolor and pen-and-ink art-all packaged in a deluxe format-give this lovely volume both the intimate feel of a bird watcher's field journal and artist's sketchbook. The wealth of drawings, field observations, and fascinating bird facts make this a useful reference and irresistible collectible. 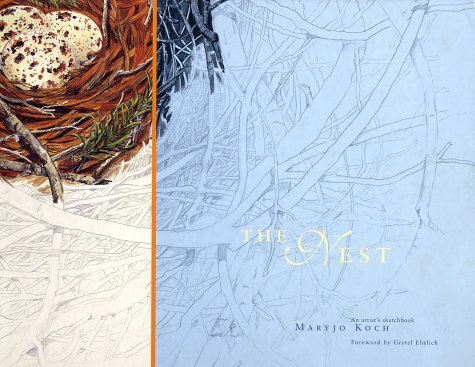 About the Author&colon; Maryjo Koch has over 300,000 copies of her nature book titles in print, including the best-selling Bird Egg Feather Nest. She also has created an array of successful gift product based on her work, including greeting cards, wrapping paper, plates and mugs, and two lines of wallpaper. Her paintings and prints are featured in select specialty shops internationally and have been exhibited at the California Academy of Sciences in San Francisco. Gretel Ehrlich is an American storywriter and poet, heralded by Annie Dillard as the "Walt Whitman of Wyoming." She is the author of 14 published works, including A Match to the Heart: One Woman's Story of Being Struck by Lightning, Solace of Open Spaces, The Horse Whisperer: An Illustrated Companion to the Major Motion Picture.